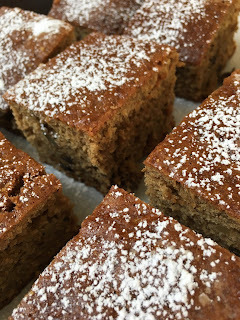 I have been testing gluten-free baking recipes like mad lately in preparation for a class I’ll be giving in September (more on that exciting news another time). The latest in my testing lineup is this delicious little number. 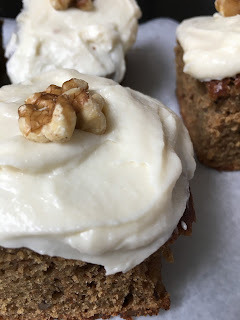 While I’m pretty familiar with using almond flour (or almond meal) in GF baking, I wanted to expand my GF flour repertoire and this recipe, which uses quinoa flour, sounded perfect. Besides the quinoa flour, it uses all-purpose gluten-free flour, but it’s the quinoa flour that gives it an interesting nutty flavor. And even though there is one cup of brown sugar, the cake is definitely not sweet. The apples provide moisture, and the chopped walnuts give it a nice crunch. Another ingredient I had not used before is xantham gum, which helps with the body and texture of GF items. If you use all-purpose “cup for cup” GF flour, it already has xantham gum in it, so you don’t need to add it. I prefer to add individual ingredients myself rather than an “all in one” type flour. 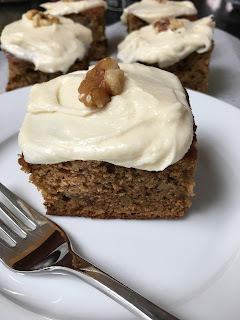 While the cake was really good on it’s own (with a simple dusting of confectioners' sugar), I felt like it was missing something, so the next day I whipped up a small batch of cream cheese frosting (thank you, Martha Stewart, for this not overly sweet version). Bingo - now I really liked this cake! It all just worked - grated apples, walnuts, dried cranberries, cinnamon, nutmeg - you get the idea. 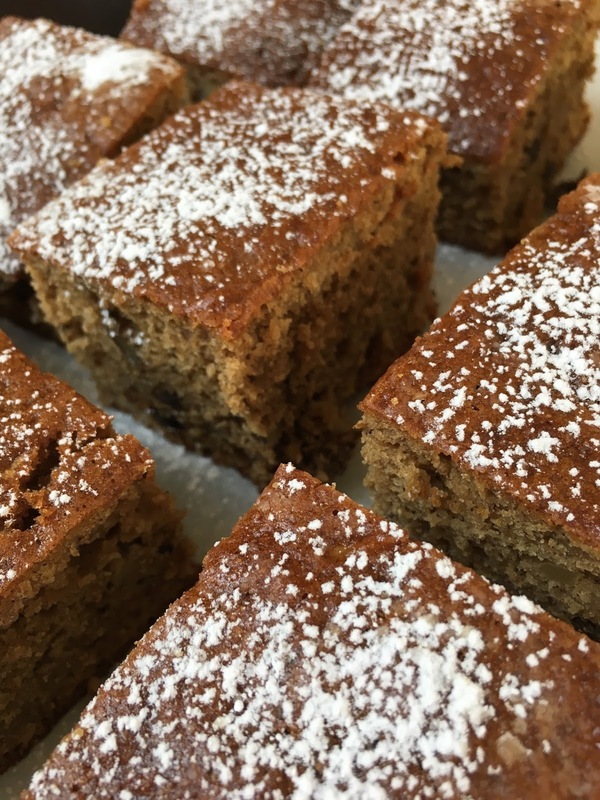 Perfect for an after school snack or afternoon tea. Do you do a lot of GF baking? Tell us about your successes (and challenges) with this type of baking. Let’s help each other create really fabulous GF desserts. Leave a comment below. Here’s hoping you have a wonderful weekend! Print apple cake recipe here.